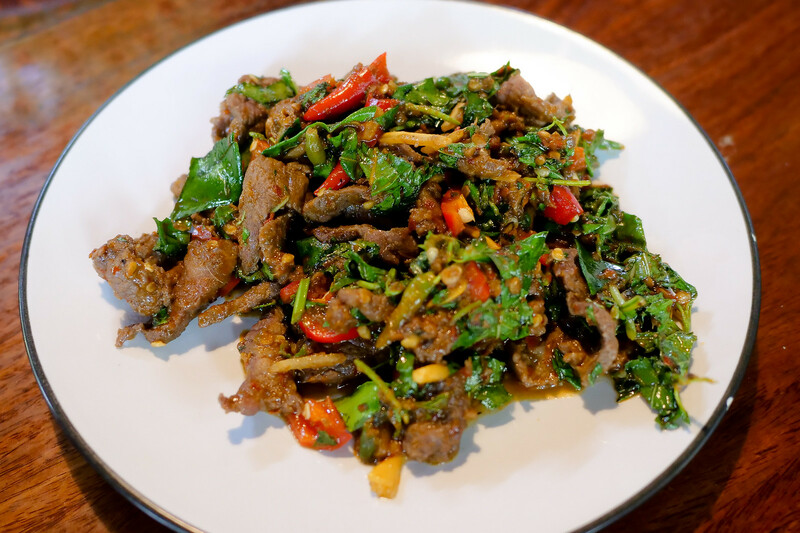 Mark Weins has been blogging about travel and food for around 10 years and is possibly the most passionate advocate for Thai food you can find online. His blogs, migrationology and eatingthaifood are read by thousands of people around the world, and his YouTube channel has over three million subscribers. He recently shared his 2018 10 Best Bangkok Restaurants on his popular blog eatingthaifood. Here’s an extract from Mark’s blog post. You can read the full article here which includes contact details for the restaurants reviewed. This list only includes Thai restaurants in Bangkok, that I personally ate at for the first time in 2018. I do tend to enjoy maximum flavor, extra spicy Thai food, so many of my restaurant choices reflect that. However, at these restaurants there are dishes you can order non-spicy as well. Restaurants are in no particular order. 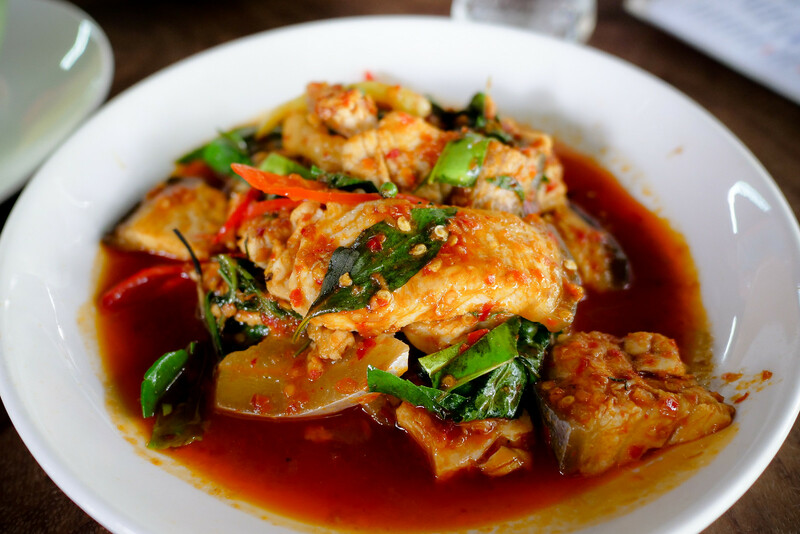 Pla Mae Nam specialises in freshwater river fish, and other wild ingredients – in Thai known as jungle food. Panya Seafood – Beer Hima is a huge family restaurant in Bangkok where you’ll find some of Bangkok’s best southern Thai food and a huge selection of fresh seafood. In addition to the amazing food “beer hima,” as stated in their name means “snow bear.” They cool their beer until nearly frozen, so when you pour it into a cup, it immediately turns to foamy icy snowy beer. Sorn is a high-end restaurant in Bangkok that serves fine southern Thai cuisine. They opened in 2018, and in the same year they opened, they received a prestigious and very well-deserved Michelin Star. In Bangkok, there are not that many jungle food restaurants, you’ll find most in the countryside, or in smaller rural areas. But Ba Chao Jungle Food is on the outskirts of Bangkok, and the owner is from Kanchanaburi, where he brings his ingredients from. 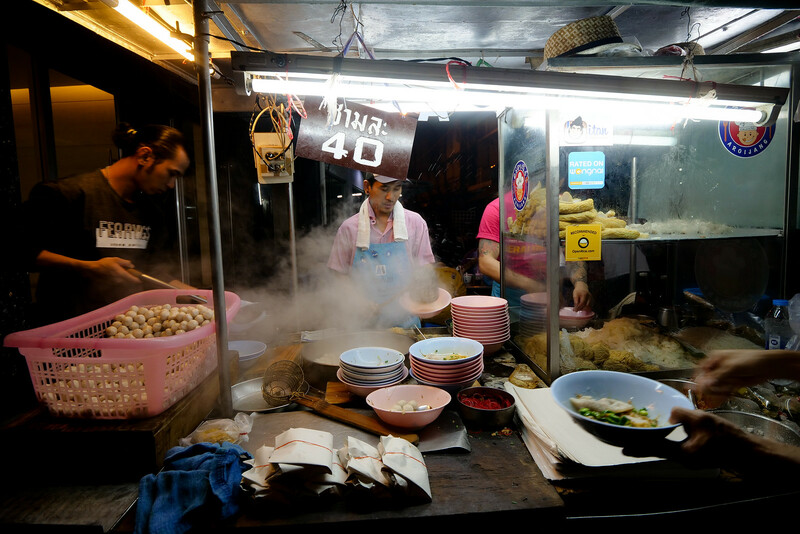 Kuay Teow Khae is an extremely popular noodle stall in downtown Silom, Bangkok, which stretches down the sidewalk on Soi Convent. Their specialty dish, and the dish I automatically order when I come here is the dry egg noodles special with everything. 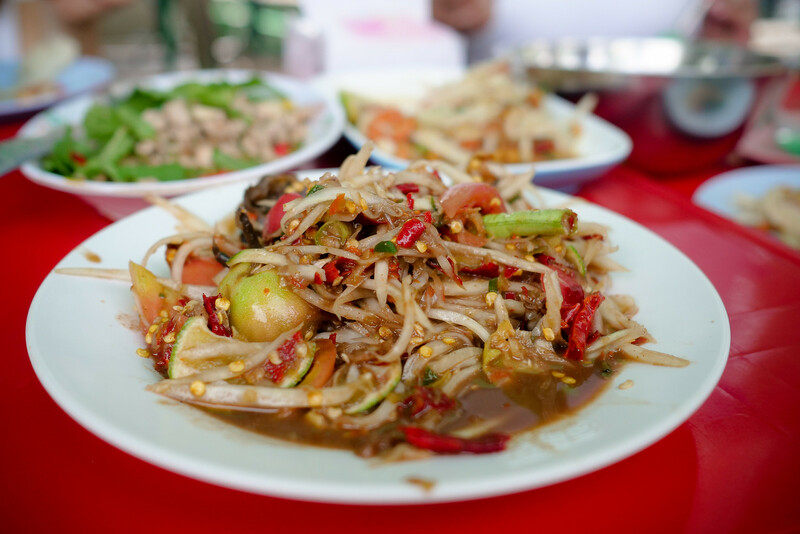 The Aunty at this small Isaan street food stall has been serving amazing green papaya salad for over 30 years. The cart is located at the top of the alley just off Ratchadmnoen Road, outside government offices and Royal Thai Survey School. Lerd Tip is Thai Iron Chef-winner Chef Gigg’s family restaurant in Lad Phrao. 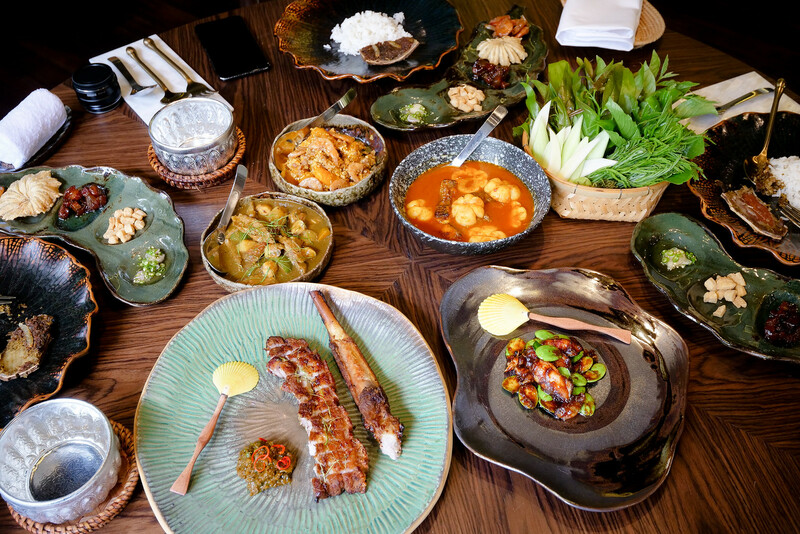 They serve mainly Thai Chinese dishes on their menu, but Chef Gigg has added a few fusion Western Thai Chinese dishes to the menu as well. 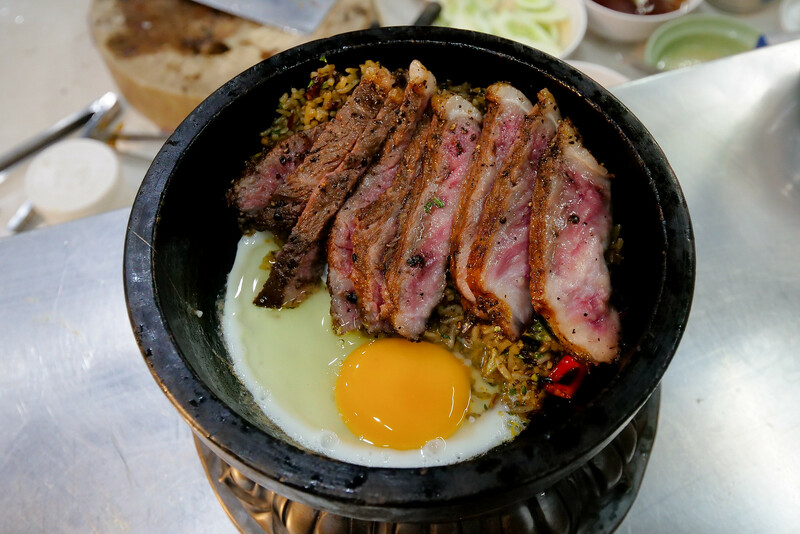 A signature dish is holy basil fried rice topped with Wagyu steak with an egg on the side served in a Korean hot ceramic pot. Lim Lao Ngow is a family Thai Chinese street food stall in Yaowarat (Chinatown), Bangkok that serves fish ball noodles. 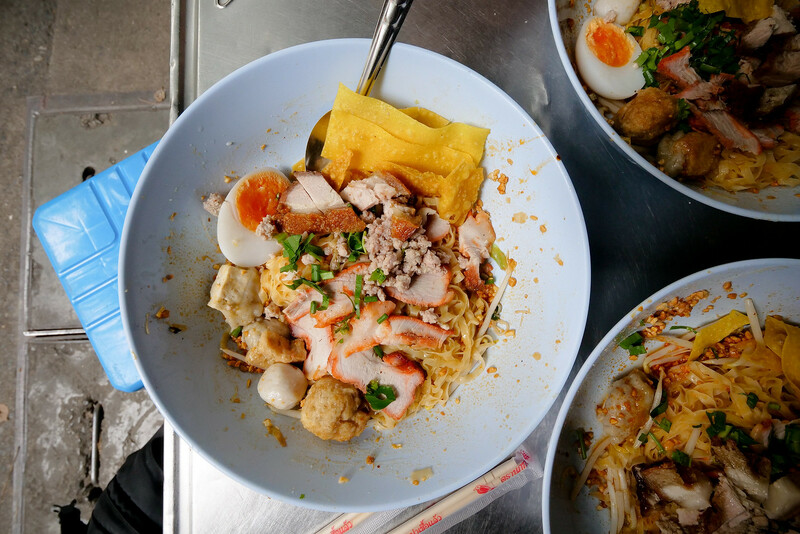 For egg noodles and Chinese fish balls, this is one of the best restaurants in Bangkok. 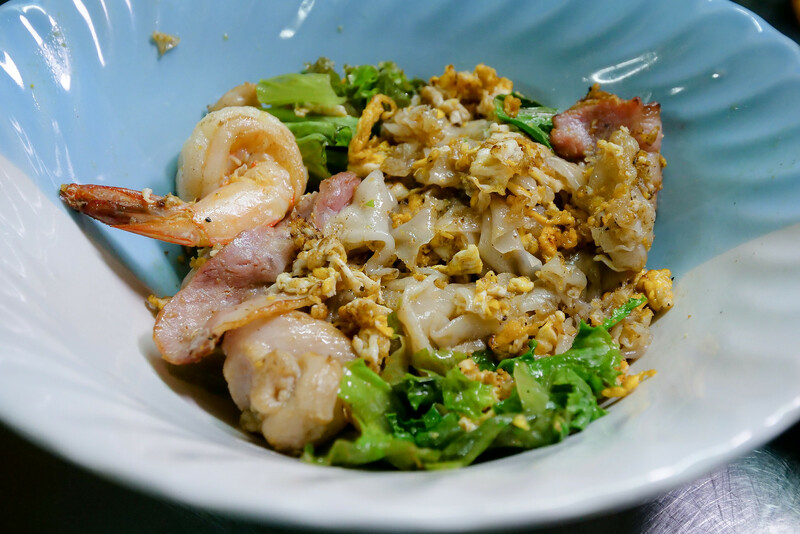 The full name of this restaurant is Jay Hong Kuay Teow Khua Gai Worachak and they are legendary in Bangkok for a fried noodle dish called kuay teow khua gai. When you eat at Jay Hong, the first thing you’ll want to order is their classic khua gai with wide rice noodles, but also don’t miss the same dish made with thin rice vermicelli. Known in full as Uncle Peen Hay Baked Chicken, this has to be one of the most unique styles of grilled or smoked or baked chicken I’ve ever seen or eaten. 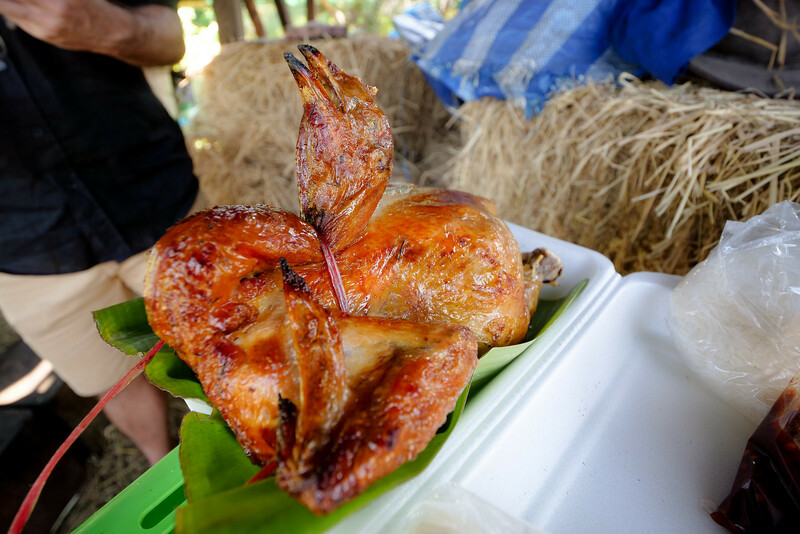 It’s actually a traditional Thai countryside cooking method, but it’s very rare to find. Read the full article here which includes contact details for the restaurants reviewed and Google Maps to help you find them.